We wake up to a less eloquent world today. Raise your glasses! BobDammit. I haz a rly big sad. Virgen de la Caridad, Ron Hubbard, Shiva, Na Tuk Kong, Tabaldak, Thor, Zeus, etc., etc., in the face for us. Much love Hitch, and many cheers. Instead of saying “For Frodo” before attacking the enemies at the Black Gates (in LoTR) they should say “For Hitch”. 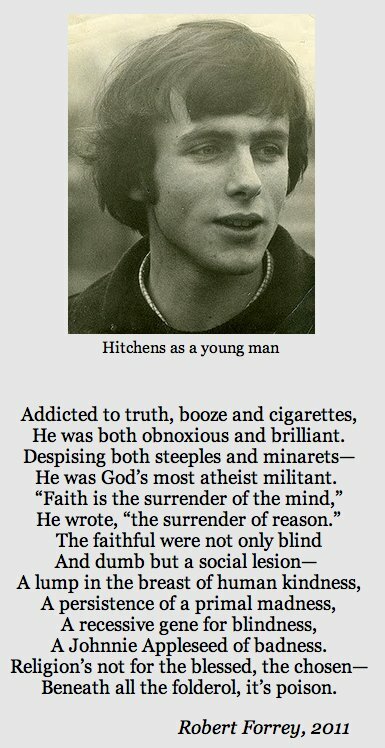 Man I already miss Hitchens badly. I have a bottle of Black Label with a very short life expectancy. Roundup of some excellent eulogies here. If you really want to honor Hitchens, make a donation to the The Reason Project or another suitable charity in his name. In fact, what kind of statement would we be making if hundreds – maybe thousands – of his fans made spontaneous contributions to such charities in his name. The press would be forced to acknowlege the sudden surge of philanthropy and those charities would enjoy considerable and sudden notariety. I think that would make a marvelous memorial to him. I’m going to make my contribution to the Reason Project now. He will be missed, except from the Religious Reich which is no doubt celebrating today. Probably gloating that he’s in make believe hell. I hope you don’t mind I made this my twitter background, copyright in tact, of course. Just tell the christians that if Hitch went to hell, he now knows that his earthly life had meaning. That makes them look even worse than normal and is another nail in their own coffins. Tonight I drink my favorite bottle of 15 year old Glenmorangie in your honor sir! It’s a cheap red but the thought counts. Cheers Hitch! Thanks for fighting the good fight. I’ll toast to his memory when I get home this evening, but it will have to be Jameson Irish Whiskey. Sorry Hitch, but I hate Scotch. To Hitch, a man who was so great that if god exsist he’s sharing a drink with him. Jhonny Walker Black accept no substitutes. To Hitch. Much Love, Complete Respect, and Endless Admiration. Salud! I wonder what he’d say if he saw me drinking Port this evening? “Wimp!” Nevertheless … Cheers, Hitch! Cheers Hitch, I’ll find some black label tomorrow and respect you properly. I’m sorry for Hitchens’ family. Growing up with an alcoholic dad and husband who was terrified at the very thought of experiencing reality without mood altering chemicals coursing through his veins 24/7 will not have been easy. I’m having a glass of the 10-year. Love those Highland Malts. Greg, I guess you never had an alcoholic parent. Ya, the timing of his / her comment could have been better but the comment is true nevertheless. Are you one of the Israeli Fonescas? I had an alcoholic grandparent who died before his time of self-inflicted cancer. So you’ll excuse me if I don’t raise a glass to Hitch. But I’ll think fondly of him nonetheless. I didn’t think it up, but it is true – we have all been enriched by his words and we are all diminished by his passing. I’ll raise a glass to him – he wan’t perfect, any more than any of us are, but his words were unforgetable. The world is a poorer place because Hitch has died, but it is a richer place because he lived. I can’t think of any better tribute than that. Hmmm… If that’s Hitch’s glass, it oughta be empty! This is beautiful, and is going on my FB wall. if he did not, then Scriptures plainly teach that he is lost forever.